Accounting Information Systems (AIS) collect, record, store, and process data to produce information for decision makers.Accounting information systems are a set of interrelated components, that interact, to achieve a goal. Most accounting information systems are composed of smaller subsystems and vice-versa, every organization has goals. Accounting Information Systems can use advanced technology, be a simple paper-and-pencil system or be something in between. Technology is simply a tool to create, maintain, or improve a system. An accounting information systems topics impact corporate strategy and culture. 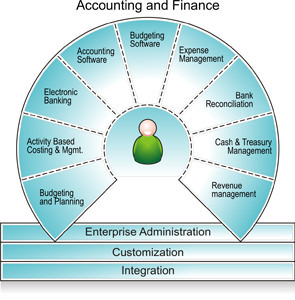 Accounting information systems offers value and is a very important part of the value chain. Although “adding value” is a commonly used buzzword, in its genuine sense, it means making the value of the finished component greater than the sum of its parts. It can mean, making it faster, making it more reliable, providing better service or advice, providing something in limited supply, providing enhanced features or customizing it. Value is provided by performing a series of activities referred to as the value chain which includes primary activities and support activities. These activities are sometimes referred to as “line” and “staff” activities respectively. Information technology can significantly impact the efficiency and effectiveness with which the preceding activities are carried out. An organization’s value chain can be connected with the value chains of its customers, suppliers, and distributors. Collect and store data about events, resources, and agents. Transform that data into information that management can use to make decisions about events, resources, and agents. Accounting information systems are the structures and architecture on which accounting information is captured, processed and reported. They happen to be computer-oriented in this day and age. To understand and create useful systems you must understand business, business processes, accounting, and a bit of technology. The subsystems should be designed to maximize achievement of the organization’s goals. Even to the detriment of the subsystem itself. For Example: The production department (a subsystem) of a company might have to forego its goal of staying within its budget in order to meet the organization’s goal of delivering product on time. Goal conflict occurs when the activity of a subsystem is not consistent with another subsystem or with the larger system. Goal congruence occurs when the subsystem’s goals are in line with the organization’s goals. The larger and more complicated a system, the more difficult it is to achieve goal congruence. The systems concept encourages integration (i.e., minimizing the duplication of recording, storing, reporting, and processing). Data are facts that are collected, recorded, stored, and processed by an information system. Organizations collect data about, events that occur, resources that are affected by those events and agents who participate in the events. Information is different from data, information is data that has been organized and processed to provide meaning to a user. Usually, more information and better information translates into better decisions. However, when you get more information (Site Financial) than you can effectively assimilate, you suffer from information overload. When you’ve reached the overload point, the quality of decisions declines while the costs of producing the information increases.